THANK YOU ALL so much for the sweet comments, calls & emails. I sincerely appreciate your support starting this new adventure. Ok...a little more info...and answers. 1. When will we see them??? 2. Will they be available in Australia??? Yes, I'm sure they can be ordered from the same distributor who provides Stampers Anonymous stamps there now. 3. Are they actually collages??? NOPE...They are collages waiting to be made by you! Start with the largest stamp...it's the foundation...add an element ( medium size)...add the small & it's done! OK...They are all sized to be interchangable for versatility. So that means...use a background from one with an image from another. They will all work well together & with other stamps you already own. Since I LOVE layering, the images are very easy to stamp & then cut out. There's no really intricate time consuming cutting involved. I did this for me...I can NOT drive an exacto to save my life. HONEST!!! ANYWAY...Just stamp them on cardstock, patterned paper or grungeboard...cut & use! They can be made into simple projects or you can add as much detail and as many embellishments as you like. That's me...the more...the BETTER! 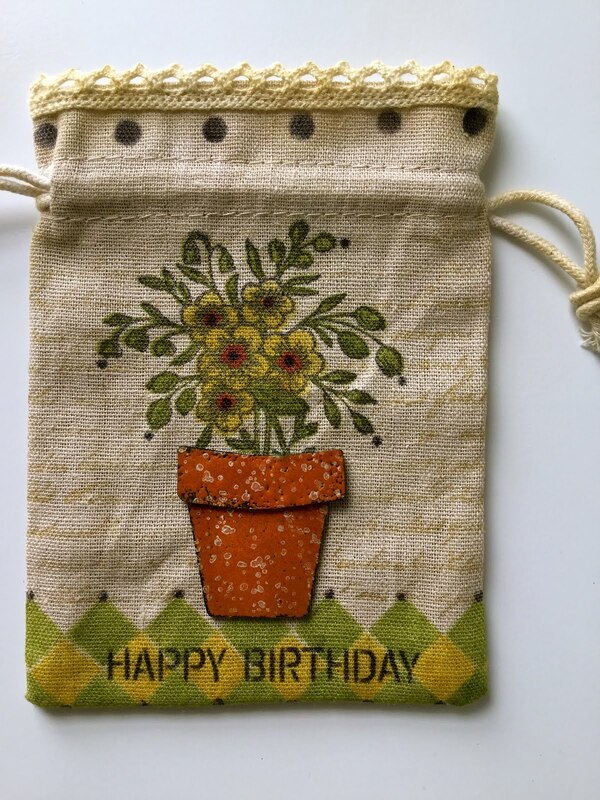 I LOVE background stamps (large ones) and flowers...Now there's a BIG hint! There are a few "basics"...these can be stamped, cut out and then overstamped. 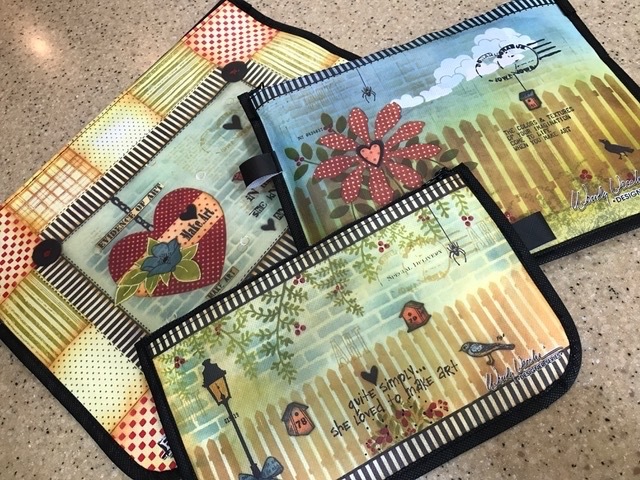 My plan is that we'll never tire of them and they can be customized to coordinate with any patterned paper you are using. Use dots, text, script, plaid, stripes or any background stamp and easily make a custom embellishment. OK...that's enough before I say too much...My lips are officially...SEALED! EDITED*** For those who are looking for the booth number of Stampers Anonymous...It's listed as ART GONE WILD/Stampers Anonymous. The booth number is 3035 & it's across from Ranger, which is 2935 and Maya Road is very near there with booth number 3507. Here's a better look... It was exactly what I needed to complete the page. with my name on them!!!!!!!!!!!! They will ALL be available cling mounted. Remember a few months back??? I asked what you all preferred?? Cling mounted received the most votes, by a landslide. Since rubber makes a great image and lasts forever...we decided rubber. Since storage is an issue, cling is the perfect solution. Some will also be available wood mounted. There will be 7 sets total...6 everyday sets...one Christmas set. I've had lots of people ask where to start on a collage... How do you design it?? How can you make it quicker & easy??? ALL the stamps you NEED to create a collage, will be in these sets. ART PARTS...all the parts you need to make art. (Mr & Mrs Stampers Anonymous) for this wonderful opportunity and for making this adventure so much fun. YOU are the best!! NO WAY.........It's WAYYYYYYY too soon for that! So, until then...still no reading, lifting or horses. He's a much better patient than I would ever be...that's a fact!! So...here's the whole card, made with Darkroom Door stamps and some grungeboard. I love big grungey flowers, but let me tell you...this little flower was fun. I stamped the tulip on plain grungeboard twice & layered it to get this effect...It's colored with distress inks (fired brick & peeled paint)...Here's a closeup of the tulip. Instead of working in the Maya Road booth @ CHA in July, I'll just be popping over there to visit my friends. What will I be doing you ask??? I'll also be a helper for tim & Claudine in their classes on Thursday. That sounds like fun too. This is better than CHRISTMAS!! Now on to the rubber part of the title...should I do it today??? NOPE...I changed my mind...I think this post is long enough! This will be THE NEWS that I've been teasing about since February. Finally...I can spill the beans!! Just a quickie post today with another tiny peek. I bet it IS grungeboard...how's that for a hint?? ps...I'll be back on Tuesday with some very interesting DEVELOPMENTS and I'll try to round up another Darkroom Door peek......stay tuned! Anyway, she asked me to do some design work with her stamps. I let her know that I had a few things done & asked it I could post them here. She said NO...tease them!! Just show them little bits! So....above is the tease. See?? It's NOT MY fault! Here's the good news. She has hooked up with a distributor for North America. The company is called Artytart. You can check it out here. The site is for wholesale orders only, but you can refer your LSS & ask that they order the stamps you NEED. If you really NEED them NOW...they are available in Canada here. Now this is fun too...Artytart is directly across from Maya Road @ CHA this summer. You can bet I'll be over there checking it ALL out!! Congrats to Rachel & Stew on this wonderful arty adventure! CHEERS!! Here's to continued success! *He can see straight out, but not down. The bubble still blocks his vision. It should completely absorb in about 6 weeks to 2 months. He can't wait, since he can't drive. *No pain now...just extreme sensitivity to light. * This happens in 1:100,00 individuals. There is no prevention. You have increased odds if you are very nearsighted & OLD. The poor guy is 57! The surgeon said...YES...OLD! YIKES!! I'll be back tomorrow with another Darkroom Door PEEK. Sweet Stephanie sent me a copy of the article that appeared in the newspaper on Friday. I was very happy to see all the photos (except mine...YIKES...when did I get so old??? )...I only expected one to be used. Thanks Stephanie. GREAT job!! And if you missed the newsletter from Cloth Paper Scissors yesterday...here's the peek of a purse, I embellished with grungeboard. This is TOTALLY FUN!!! There will be more info and a full photo in an upcoming issue of their newsletter. I don't have the exact date just yet. The great small flower stamp is made by Art Gone Wild & it's one of the 4 flowers that are on the "wildflower cube". PERFECT for grungeboard! Eyeball update...He's allowed to walk around today! YIPPEE!! Here's another card that I made for Maya Road for the stationary show. I used just the largest 2 pages of the 2 Ring Layer book, for an odd sized card. I like the combo of fired brick and peeled paint distress inks. All the rub-ons and chipboard are by Maya Road. The background stamp is from Cornish Heritage Farms. The inside top... somehow that favorite Stampers Anonymous stamp, just seemed perfect. I LOVE it so much...I now own 6! Hey... less sharing in classes! And ...the end...Maya Road rub-ons and more metal trinkets flowers. You might want to sign up for the FREE email newsletter from Cloth Paper Scissors. You just might recognize someone & get a grungey peek of things to come! Got it?? The peek is coming today...the grungey story a bit later. New favorite product update...Don't worry...It's VERY INEXPENSIVE!! At Ranger U, I was introduced to Stickles. I was probably the only person there who had never used this product. I lead a sheltered life! HA! Anyway...check out my favorite color...CINNAMON. It's great for vintage looking projects. I used some on some grungeboard butterflies...cool. And DO NOT MISS THIS...check out tim's projects from THE CRUISE. Think the guy has a little talent??? GEEZ......This is serious...DROOL MATERIAL!! Time to head to the studio & HOPEFULLY get something accomplished today. I hope your Tuesday is great! Good morning & THANKS so very much for all the heal quick messages for Rick. He had his first post op visit on Friday & the surgeon's exact words were..."I couldn't ask for better results". PHEW...That made us both really happy. Rick swears that those 3 creme horns on the day of surgery were the miracle cure...I'd like to think it's the expert private duty nursing care! I bet Dr. Lagouros thinks it's his work...whatever!!! He's doing very well. Today is his last day of laying. Tomorrow he's allowed to get up & walk around. He's really looking forward to that since he's been laying since Wednesday. He's an outdoorsy guy so this has been hard & boring...but mandatory. Probably the hardest thing was having his horses moved for a few weeks. Luckily one was already @ the trainer & his good friend took the other to his barn. I have nothing to do with those beasts...they scare me to death. Plus after 30 years in surgery, I like nice & clean. No flies or big stinky poop for this chick! He has another appointment on Friday, so we'll see what the progress is then. Again...we both appreciate the messages & calls. 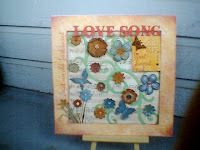 Yesterday I taught the fun Maya Road townhouse & tags class @ Scrapbook Friend'z. It's a 4 hour INTENSE class...but these gals worked hard & made some adorable houses & tags. There are tons of bits & pieces in this kit. But...it's all about adding the detail. That's what makes it interesting. The more layers...the better the look. This one is from Hampton Art and the item # is 2635 & it's called SCRATCH PATTERN. 3060-0...SCHOOL PAPER. This site has some stamps with funny sayings that will make you laugh out loud. Catslife Press is the cool company that makes stamps that are prefectly sized for the McGill file tab punches. You'll find Susan here. Tell her that I said HI! She's a sweetheart! 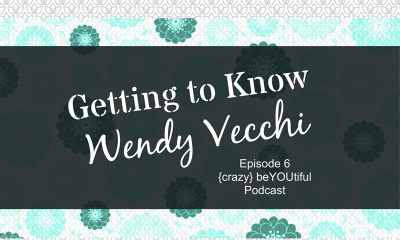 Grab a cup of coffee before you go to her site. There are a ton of fun stamps there. Just when I had my ink drawer perfectly arranged & thought I'd never NEED another ink pad, Ranger comes out with some new pigment ink. I only bought a few colors...certainly I didn't NEED them all. I WAS WRONG!!! They are opaque, simple to use & give a smooth matte finish easily. A 30 second blast with the heat tool & you're done. Check the link above for more details. The bottom 2 layers below are MR chipboard & the flower center is cut from grungeboard. 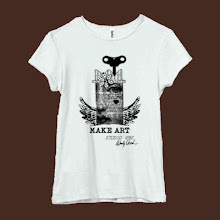 The stamp is from Art Gone Wild, the parent company of Stampers Anonymous. Below is the pad dabbed onto textured grungeboard. SIMPLE & a totally different look than the distress inks. See that flower center?? Tim's new hitch fasteners from Advantus. Why do I see everything as a potential flower part??? for all the sweet comments, emails, calls, good wishes & prayers. He's not allowed to read...so I read each & every message to him. From both of us...THANKS!!!!! So far...so good. He seems to be doing well, but we should know more tomorrow after his MD visit. The results are not known immediately, but his surgeon did say that he was pleased with how the procedure went. On a funny note...(we always have to laugh, to ease the stress)...when we got home he just knew that he'd be much better if I went & got him 3...yes 3...creme horns. So believe me...that's exactly what I did! This is another Maya Road card for the stationary show. The scroll, ribbon, buttons & yummy velvet sparkle blossom are all Maya Road. The inside. There's that Fiskar's punch again. I'm loving it! Here's a closer look @ the ribbon slide detail. A thin strip of coordinating cardstock was just what I needed. A button on top added some more dimension. And the back. The chipboard circle is from the foundations tin and the stamp is from the Signed Sealed & Delivered stamp set. OOPS...one more thing. The paper is Paper Loft. for my sweet hubby. We found out yesterday that he has a detached retina. So 2 eye doctor appointments yesterday & this morning we're off to Peoria for retinal surgery. Keep your fingers crossed that the reattachment is successful. Without a retina, you have no vision in that eye. This cute paper is by Jenni Bowlin, and it's on some Maya Road square banner pages and some chipboard houses from the Heart & Home tin. ( same houses that I used for my banner) These pages are the perfect size for cards. I like that they are strong & easily stand alone for display. More Jenni paper and Maya Road goodness..the key, rub-ons, ribbon, stamp & foundations rectangle...all Maya Road. On Friday, I posted a peek. Today...here's the whole enchilada! This was one of my assignments for the New York Stationary show, for Maya Road. It's the treasure box loaded with fragment fun. The lid has a recessed area with a sheer insert, so I played with the fragments until I found a pleasing pattern that fit the recess. All the rub-ons are by Maya Road and what is REALLY fun is using such small bits of them. If you enlarge the photo, you'll see small sections from the Cubical sheet. The paper is by Basic Grey. It's their Archaic line. LOVE it! I'm sure you recognize my fav Stampers Anonymous stamp, by now. It seems to fit with any project or style. Just a few MR trinkets metal blossoms ( bent) and some glaze pen dots and the box was complete. This will be added to the classes that I currently offer. It's great for using those scraps & left overs, instead of tossing them in the trash. Since this is a stationary show, we were also asked to design some cards for display. Here's my favorite, using 2 pages of Maya Road's square banner book as the base. It's embellished with their crushed velvet ribbon, button and the trinkets metal flower...again. I adore this paper by Heidi Swapp. It's perfect for guy cards or vintage projects. The large image stamp is from Paper Bag Studios. The "defined" is from Maya Road. It's in the DEFINED set. Hmmm...that seems appropriate for the title! Here's a closeup of the crackle paint on a MR corner scroll. When these paints were first introduced, I didn't think I'd NEED the black. I didn't think that the cracks would show up very well...WRONG.!!! It's actually one of my favorites now. It adds great texture & dimension. If you enlarge this photo, you'll see that the trinkets metal flowers are fun to cut in half, for a new look. For more ideas & inspiration...make sure you sign up for the consumer newsletter from Maya Road. Caroline is working on it now & it will be sent later this week. The DT got a sneak peek over the weekend & I know you'll LOVE it! AND...the price is great...It's FREE! Sign up here. The sun is out & yes...the furnace is STILL on. Here's a tiny piece of a project that's headed to NY with Maya Road for the stationary show next weekend. You can easily customize the trinkets metal flowers, by punching coordinating paper from your project, and then using it as a flower center. Last week I got an email from Jane Guthrie, who is the editor of Scrapbooking and Beyond and also Paper Creations. 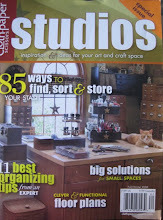 I will have a "project" published in either the winter issue of Scrapbooking & Beyond or Paper Creations. She hasn't decided just yet. YIPPEE! So, the instructions are all typed up and the "project" has been sent and one thing is checked off the to-do list. To finish up the newspaper interview, the photographer is coming this afternoon. Hopefully, he'll take photos of my studio or my art & NOT me. I HATE to have my picture taken. YIKES...it's hard to believe that CHA summer is only about 2 months away. Assignments should be coming very soon from Maya Road. 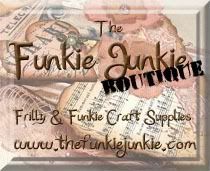 We did get a sneak peek of some new products......TOTALLY cool stuff you'll LOVE! Also for CHA...art for Stampers Anonymous & some tim/Advantus grunge stuff. Got one grungey "thing" done already...REALLY cool, if I say so myself!! HA! I'm dieing to get a few spare minutes to ink up Rachel's new stamps too. Got some ideas brewing...just need some time.......I haven't forgot you Rachel! Have you done a cool Maya Road mini album??? This challenge starts Thursday, May 1st and ends Sunday, May 11th. To enter, you simply need to upload your project to the Two Peas member gallery - don't forget to check the "Maya Road Wants To Take Your Mini Album To CHA" member challenge! Two winners will be selected on or around May 15th. Winners will have their projects displayed in the Maya Road booth at the 2008 CHA-Summer show in Chicago. Winners will also receive a $100 prize. (edited) to answer questions....YES!! ANY Maya Road mini albums/books. Enter to win! Have a great weekend & Happy Mother's Day to all! And the product tip of the day. My sweet friend Katie sent me this adhesive. We saw this adhesive @ CHA-W and got to try it on the Maya Road sheers. We were jumping for joy with the results. I've been searching for it since February and thanks to Katie, now I have some!! Interview update. YIKES! Sorry I forgot to tell you about that. Thanks for asking!! Anyway...Stephanie came & we talked about some fun stuff...Maya Road, Ranger, Tim Holtz, Stampers Anonymous...CHA...and grungeboard. She's just getting "into" stamping, so this was fun. She called again yesterday for more info & is sending a photographer to get some shots of my work. So...when it actually gets published, I'll post it here. This made me laugh...the first thing she HAD to see was grungeboard. I think she's sold! Ok...that's it for today. I'm off to the studio to finish up another townhouse & tag set for the class @ Scrapbook Friend'z on May 18th. Chipboard, mini alphabets, papers, inks and fragments = 4 hours of fun! I have a very hard time making sympathy cards. I always feel really bad having "fun", when the recipient of the card is actually very sad. So my thought is to keep them simple. A little stamping ( Stampers Anonymous, Hero Arts & KI Memories) and a little grunge. Simple inside too, but I always feel that handmade is from the heart. May 5th...the sun is out & beautiful, but the damn furnace is still running. Hey...can I say damn on my blog?? YIKES!! I guess I just did. Remember that scallop Fiskars punch from a few weeks ago?? Here's another one that I love. I got this guy @ Absolutely Everything, in Boston. Fiskars named this one...Leave it to weaver. Makes me laugh! You can easily thread ribbon or cardstock thru the perfect holes to create a custom border. Another option is to weave thin strips of coordinating colors, instead of just using one larger strip. The card below is an example of how I used it and added it to the scallop punched edge. Once again, just what I like...easy & FUN. Today @ 10am I am doing an interview with a newspaper (Ottawa Times) to talk about my art. It should be fun introducing someone to this art form. I better run & make sure that my studio is in tip top shape. Hope your weekend is the best ever. Here's the eye candy I received yesterday from Dolly. She was the lucky winner of the drawing for some Hero Arts stamps a few weeks ago. As promised I inked up the Hero Art stamps AS SOON as they came!! Here is one example of what I made with them. I will have more but I was so excited to get this completed I just had to share it with you since you were in a big part my inspiration on this! I went a little grunge crazy! Okay LOL I went alot grunge crazy. This is an important LO to me as it is the capturing of our baby's first heartbeat! So it had to be full of Ranger!! Ton's of grungeboard, stickles and ton's of distress inks. Of course you will find the new beautiful Hero Art stamps in there along with several other stamps. Also some Hero Art pearls that Shari sent along!! Thanks Dolly, for sharing this with us. It looks absolutely WONDERFUL!! Baby congrats to you!! !